Each player controls a base where their creature can train. When the player feels their creature is ready, they can release it into the Arena. 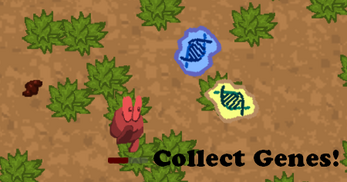 The pet can collect Genes in the arena. Genes make your next creatures stronger, and collecting the most genes after 20 genes have been picked up means that you win! 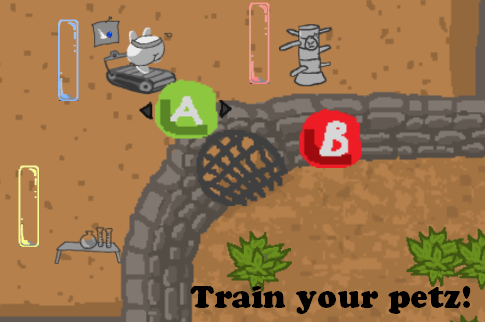 When your creature dies, a new one is hatched at your base and you can train it again. Swoosh (treadmill): Runs faster. More likely to be distracted by Fruit. Strongth (karate gym): Fights better. More likely to be distracted by Fruit.